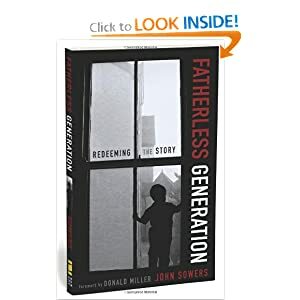 On my first flight of The Trip That Almost Wasn't, I opened Fatherless Generation: Redeeming the Story by John Sowers and within exactly 1.5 paragraphs, I was crying. It was only the forward. And we hadn't even lifted off yet. "Fatherless men need friends who are proud of them." (forward by Donald Miller) I was done. Two paragraphs in. That's all it took. I flew through the rest of the book, curled up in a vinyl seat in O'Hare F-11. It's fairly short and an easy read, but it yanked my heart so hard. Of course I could only think about our Robert. It helped me make sense of so much more of him. It gave words to all of my sinking suspicions. What surprised me the most was not how closely Robert aligned with the traits of fatherlessness. What surprised me was realizing how easy it was to love this boy, and how quickly our love began to change things. I would read about apathy, about lashing out, about disregard for authority and it would remind me of the kid I met 2 years ago, not the one I know now. (Please do not tell him I just called him a kid.) Yes, he'll fight the fall-out for a very long time, but now he knows he has all our love. He knows he has all of us. It changes things. So of course it makes me wonder, how many other Roberts are out there? It seems safe to assume that there's at least one on every block. What if every family found theirs and stubbornly refused to stop loving him? Or her? We're commanded to care for the orphans...What if we all really understood that even though our country has abandoned the concept of orphanages, we're clearly a nation whose fathers have chosen to stay away? The orphans are everywhere. It seemed so improbable that the consistent love of two nerdy white people could help fulfill the appetite in the soul of a child with "Pain" "Kills" tattooed on the tops of his hands - black on black. He shops at Max 10, we shop at the Gap. Trey Songz/Avett Brothers. McChicken/Pad Thai. For a slick second, these silly differences made me feel like we'd be foolish to even try. They made him feel like we were up to something. But we pushed, he started pushing too, and before long, we met right here where we stand. We stopped, looked around, and saw that in choosing to step right over the ditch separating the absurd and the necessary, we had become a family. So yes, I loved this book. I hope you'll read it and if you do, I hope you'll tell me what you think. wanna know something fun? I went to college with John and call him a friend! Love what a small world this is! I think this book would be a big help to me. Thanks for the recommendation! okay, great! :) thanks so much for your reply!! I appreciate it. Even though I am a woman, I can relate. My dad was never available. Either working or drunk. A terrible excuse for a father. It definitely haunted me in my younger years and made me choose bad men to date, love, etc. Eventually I became smarter, bored with my "issues" and had a very great and loving best friend. I also just stopped dating at all for a few years until I was able to become clear on things. And then I met Brad..my sweet hubby. I think that you two nerds (LOL and YOUR words!) have more in common with the Roberts of the world, just like I do. I could say more, but don't want to start quoting Gary Busey. Totally! The things we have in common are so much bigger than the jeans we wear. We're the same at our core, with enough external differences to make life...interesting? Entertaining? Freaking awesome? All of the above! so many 'roberts' in our church in vegas... thank you for the recommendation! I can't wait to read this book. I have a 9 year old son whose birth father was a drug dealer and has been out of our lives since he was 2 1/2. He was dangerous and I had to make the hard choice. I wanted a better life for us. I cleaned up and married a wonderful man who became his true father when he was 4. Life was finally becoming what I had dreamed of. Then my husband died of cancer when my son was 7 1/2. My son is so desperate for a father figure in his life. There are men from our church who have reached out to him, but no one has made that connection with him yet. My prayer is that he will know that he has a father in Heaven, but also that God will provide him a father here on earth in the meantime. Girl, thanks for sharing your story here. This is heart-wrenching, but God holds your little guy's heart. Praying and believing with you that he'll bring the perfect man into his life - soon! Saving the world, one Robert at a time. This book is spot on. Our schools are full of these boys and girls, we just need to look inside ourselves to save them. Love the way you love, FPFG. Thank you for the review. I already ordered my copy and can't wait to dive in. My own "big kid" is so angry and has no hope. I pray that God will make hers a story like Robert's and that she will see her true value in Him. There are so many who have told me that she is a lost cause and that I should give up and move on. I refuse to believe that and know God has a purpose for bringing her into our lives. Thank you again for your continued posts about this. They bring so much hope just when I need it. i repinned this book from seeing your pin. my own son. he is 18 and today i had the change to put a teensy bit of this into practice by encouraging him..to be a man..telling him i believed in him and that he could do it! can't share what surrounded it all of course but there was a difference in him. Sweet lady, this is why I keep coming back here again and again. Because you love so dang well. You inspire and remind and share. Makes me all teary to know that Robert knows you are proud of him. That you are in this. Praying for him! The only thing better than reading a good story is living one. Which is what you're doing. A few years back, 2 of my girls were attending an urban high school (North Side in Fort Wayne), and thru them, we befriended a set of twin boys who never knew their father, and their drug-addicted mother gave them up. They bounced from foster home and orphanages. Anyway, we had them over for Thanksgiving (imagine my huge white family and 2 huge african american boys in wonder at the (not well-cooked) homemade meal). They're birthday was coming up, so I made them a cake and we sang happy b-day....then they shared that no one had ever made them a birthday cake. EVER. You inspire in your honesty (and you're decorating). I wrote a bit about you on my most recent post. It's a cryin' shame we live so close and have never met. It's on my (rustic aqua) bucket list. Be warned. gonna pick up that book....and add it to my list of books to read in 2013.
i seriously need to light a FIRE to my behind and READ...the list is growing. I too grew up without my dad. I'm 29 now and as a kid I never really thought much about it. I thought I was fine. It wasn't until my early twenties until I realized how affected I was by this. I finally reached out and found my father this last spring. We wrote back and forth for month, though we only lived less than 20 miles away from each other presently and my entire growing up. It's hard. I want to be upset and hurt, but I can't change the past, and unfortunately I was very complicated for him. I just finally met my dad this past fall for the first time in my life. He's a nice man, we talked and cried and talked some more about our lives and everything we could. It was one of the greatest fears I have ever overcome. Even though people may think that I shouldn't... I want to make my dad proud... as soon as I got that first letter back from him, I've wanted to make him proud, it may be messed up, but it's how I feel. Now, wanting to be a parent myself, I know how important the relationships and interactions of both parents are, especially since I didn't have the greatest experience growing up without my dad and with my mom... she just wasn't the best person to me to help me develop emotionally and mentally. With my story, and all this said, I can tell you- you are doing something amazing. 'the orphans are everywhere.' this line will do me in every time. My sister & I were adopted from Korea in '75. I was 5 & she was 3. We had already spent a year in a local orphanage and one in Seoul. Our childhood in Korea & in with our adoptive family was similar to Roberts. Reading your post on him reminds me of the millions of decisions that I could have made that led me down the same path. People who have never know privation, poverty, & abuse overlook how extremely hard it is to be "successful" in life without the loving support or guidance of someone, anyone. There were so many adults in my church, teachers in school, people in the community who could see the troubles my sister & I were going through but nobody stepped up. It was extremely demoralizing going to adults to ask for help & being denied and top of that, made to feel that we were too "dirty" because of our poverty. ( or stigma of being a foster kid) Worse is seeing the kids that were receiving extra care and guidance (school especially-college prep) were students with parents that had money & resources. My sister & I were respectful, kind, artistic kids and I really like & appreciate that you can recognize that in Robert and the teenagers you help. Thank you for providing a loving home for all of your children. I saw John Sowers at the Justice Conference last weekend and I'm so glad I chose to attend his break-out session. It set the tone for the entire weekend. I see the pain of a fatherless generation in the eyes of the kids I teach in Philly and it breaks my heart daily. They're aching for real relationships, love, and security. I just discovered your blog a few weeks ago and it has inspired and challenged me. Thank you!